Managed industrial Ethernet switch, nine Gigabit ports and five Gigabit combo ports, aluminum IP31 housing and NEMA TS2 certified. 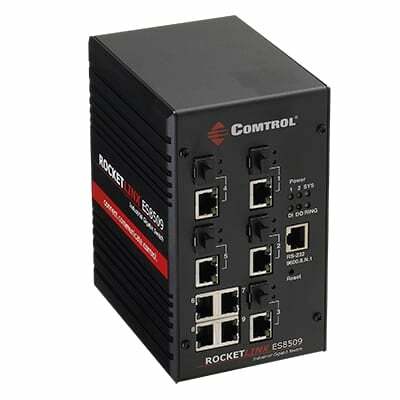 The RocketLinx ES8509-XT is a managed industrial Ethernet switch that brings the speed of nine full Gigabit Ethernet ports together with the flexibility of five DDM capable SFP fiber communication ports in a managed, wide-temperature rated switch ideal for traffic and industrial-grade networks. The combination of Gigabit copper and SFP ports along with advanced management capabilities such as IGMP snooping, LACP, 256 VLAN support, multiple redundant ring configuration, and extensive security features places the RocketLinx ES8509-XT in a class by itself for meeting the high-bandwidth, wide-area requirements of the most demanding industrial network infrastructures. 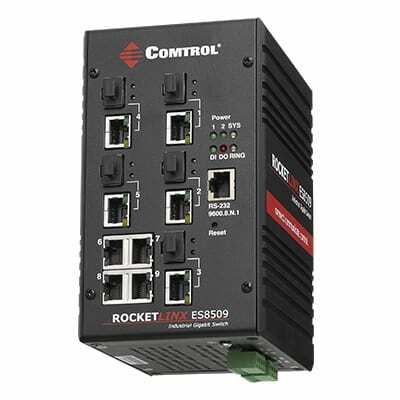 RocketLinx ® ES8509-XT Quick Install Guide Quick guide to installation and configuration information.